Watch Repair, Hints & Secrets! All mechanical watches need some source of power to function. Motive power is that force that drives the gear train which in turn drive other necessary components. 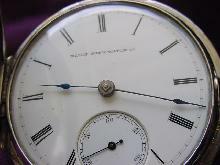 This motive power is usually introduced into a watch movement by turning the crown which in turn winds a long, narrow, thin spring called a "mainspring". This power is stored in the movement as potential energy and is the sum of all the power that was introduced by your fingers. That is to say, twist the crown once and that power is transferred from your finger tips into the movement. Turn the crown once again and that power is added to the last turn and so on. So we can see that after many turns of the crown a considerable amount of energy will have accumulated and is now stored or locked in the mechanism. The mainspring is usually enclosed in a type of cannister or barrel called, yup, a "mainspring barrel". This barrel will either have teeth along its circumference or a toothed wheel attached to it. If these teeth mesh with another gear or pinion and is now permitted to turn it will begin releasing its stored energy, transferring it through the gear train. If permitted to spin freely the gear train will allow all the stored energy to escape very quickly. So it's obvious that if we wish to retain this energy for a predetermined period of time then the gears must be kept from spining freely. The mechanism must be a controlled and nearly closed system. Something must keep the energy from just passing through or escaping from the movement.